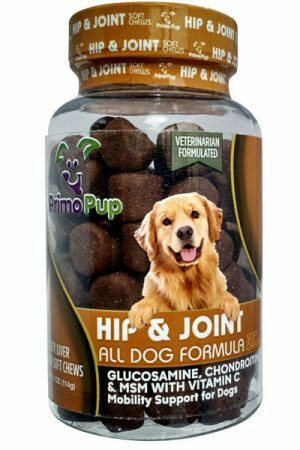 Primo Pup Calming Aid Stress Support for dogs with Chamomile, L-Tryptophan, Hops, Ginger root, and L-Taurine helps maintain a normal and relaxed disposition for dogs exhibiting nervousness, discontentment or responding to environmentally induced stress. 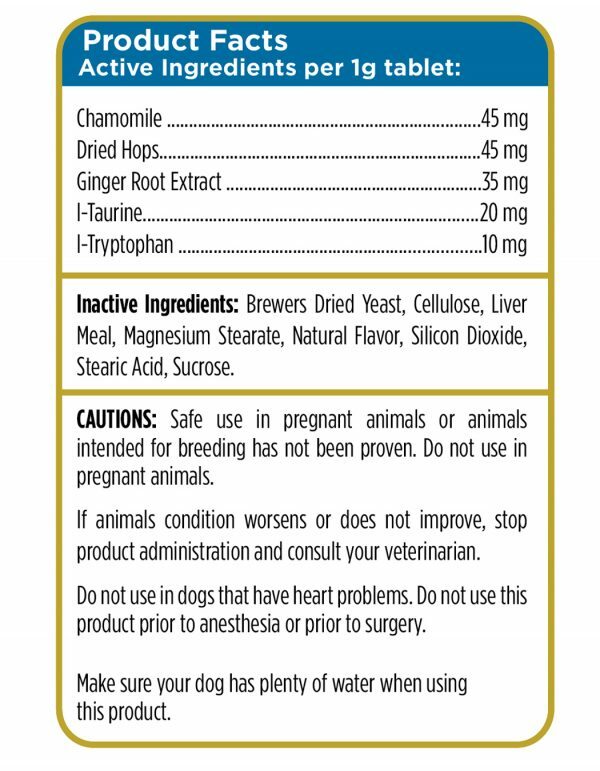 The veterinarian formulated Calming Aid helps pets cope with external stresses by supporting a normal emotional balance and nervous system function. 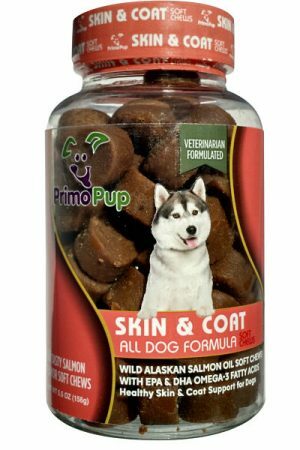 As with all Primo Pup products, the Calming Formula is made with quality ingredients in a facility meeting human consumption standards. It is free of grains, artificial flavors and artificial colors. ⇒Helps maintain a normal and relaxed disposition for dogs exhibiting nervousness, discontentment or responding to environmentally induced stress. ⇒Also great for travel induced stress and separation anxiety. ⇒Please Note: This product is a relaxant that helps to provide a sense of wellbeing in times of stress. 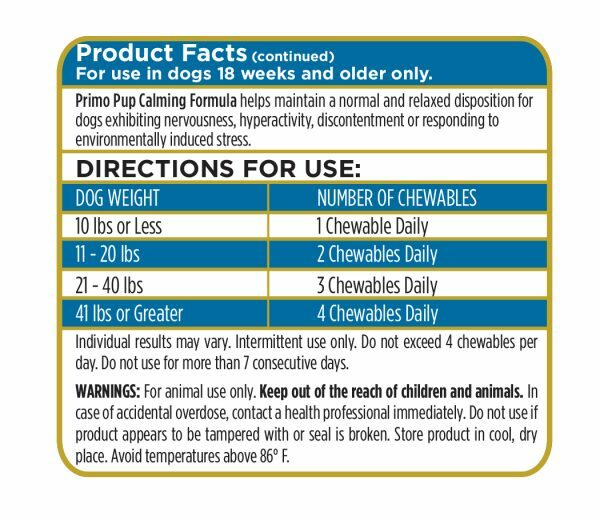 It is not formulated to correct behavioral issues such as destructive or aggressive behavior. Chamomile is one of the most ancient medicinal herbs known to mankind. It can act as a relaxant to calm nerves and reduce anxiety, to help with hysteria, nightmares, insomnia and other sleep problems, motion sickness, nausea. Hops have been known to offer soothing, relaxing, tonic and calming effect on the body and the mind. Ginger root may help to relive motion sickness. l-Taurine is found in several organs, and its benefits can be widespread. It aids in hydration, digestion, supporting the general function of the central nervous system and eyes, regulating immune system health and antioxidant function. l-tryptophan has been shown to alter mood. It has been used for insomnia, depression and to calm nerves. Just like people, many different factors may cause pets to experience stress, such as travel, veterinary visits, separation from owners, strange environments or loud noises. Some signs of environmental stress in a pet may include hiding, nervousness, loss of appetite & separation anxiety. 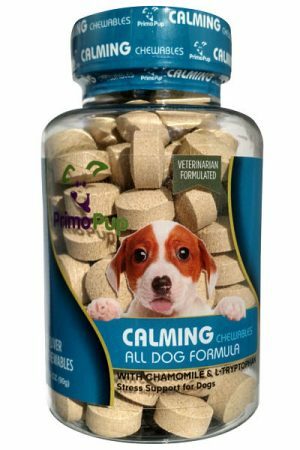 Primo Pup’s calming formula helps pets cope with external stresses by supporting a normal emotional balance & nervous system function. 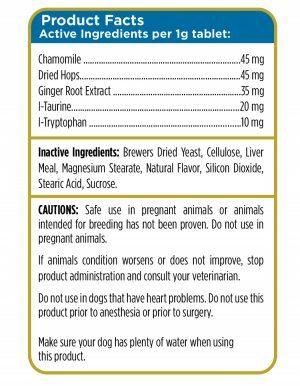 It is a veterinarian formulated blend of chamomile, hops, ginger root, l-taurine & l-tryptophan that help to keep your pet calm & relaxed. This Calming Aid is a relaxant that helps provide a sense of wellbeing in times of stress. It has not been formulated for, nor is it effective in treating, destructive or aggressive behaviors. The calming aid can be used in conjunction with behavioral modifications and training, but is not a replacement. Does Stress Affect My Dog? Just like people, many different factors may cause pets to experience stress, such as travel, veterinary visits, separation from owners, strange environments or loud noises. Some signs of environmental stress in a pet may include hiding, nervousness, loss of appetite & separation anxiety. How Does A Calming Supplement Help? 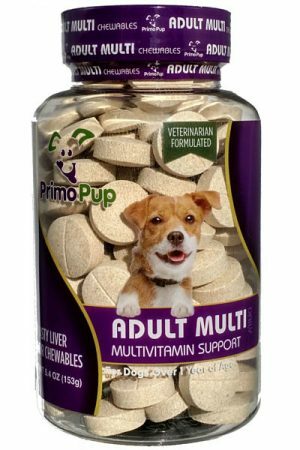 Primo Pup's calming formula helps pets cope with external stresses by supporting a normal emotional balance & nervous system function. What Makes Calming Supplements Effective? Primo Pup Calming Formula is a veterinarian formulated blend of chamomile, hops, ginger root, l-taurine & l-tryptophan that help to keep your pet calm & relaxed. Are The Calming Supplements Tasty? 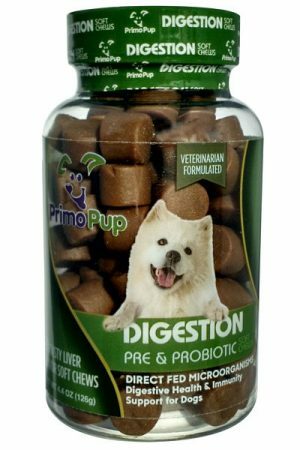 Primo Pup Calming supplements are chewable liver flavored tablets. 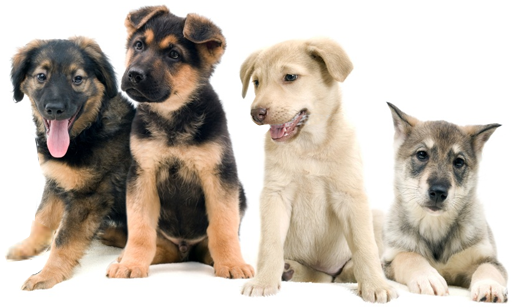 We perform extensive palate testing & find most dogs like them as much as their favorite treat. I have a very nervous anxiety ridden dog and these have really helped calm him in stressful situations. And a plus is they’ll eat it without putting it in a pill pocket of some kind. Looking forward to ordering this again. This works so well I almost feel guilty. We give it to our 5 month old beagle. Just one in the evening, she’s 15 lbs. She is exercised during the day and taken to the park but something happens at about 8 o’clock at night and she goes crazy running around the house play biting and jumping on our faces! It takes about an hour for it to work but then she’s calm and quiet, happy to play with her toys or chew a bone. Then curls up with us for snuggle time. Pretty much the perfect dog. This calming aid does NOT contain melatonin, and that is the reason I purchased it for our dog. He takes another calming aid for a daily anxiety treatment, and this is added when there is a storm or gunfire from hunters. 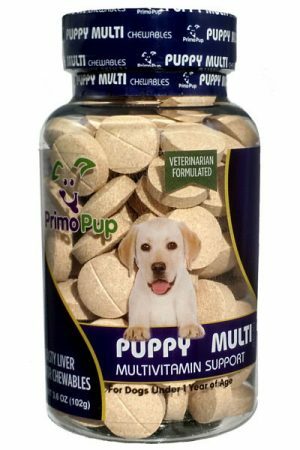 The other product has ginger and valerian, so Primo Pup’s Calming Aid is a great addition at times of high stress. 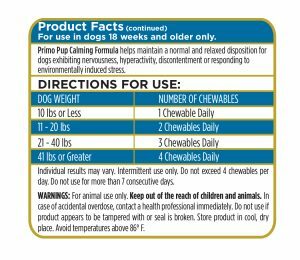 Our dog weighs over 100 pounds, yet I only need to give him 1 tablet as an additive to the other natural calming product. Give this product a try! I am a volunteer of homeless dogs. I brought this product because the dog Foon that I fostered was so scare of human and new environment. Foon had tick fever when she had just been rescued. After two cycles of treatment, a family willing to adopt her. Unfortunately, the family sent her back one week later as Foon was keep feeling anxiety in new environment and her gum was turning white. The worse was that she seizure every two hours. Foon had to take the third treatment of tick fever after coming back from the adoptor. I found this product in Amazon US and decided to deliver it to Hong Kong and hope it can help Foon. This product really help Foon a lot and she has been adopted successfully now. I am going to use the rest (around half bottle) to the other similar homeless dogs and hope they can find a home successfully. Thanks to PrimoPup !! This is the best for our smaller anxious puppy ! Calmed a 90lb Doberman! He acts 100% normal, just settles himself down instead of barking while in the kennel. He drools a little more than usual, but this is a great product. I have also tried it on two 30 pound small guys, I had a hard time getting one dog to take the medicine, but he eventually took it. I didn’t see the same results in the small dogs as I did with the big dog, but it is different dosages. I have a xlg dog who lives inside most of the time. He is very laid back and a big mommah’s boy, till I leave him here with my other dog for several hours. 2 primo pup calming pills in a hot dog and classical music make him a wonderful boy. He has emergency pee pads he rarely uses, he no longer takes the house apart….it’s marvelous. My dog is a very spoiled rotten hyper husky pit mix. She eats away. Loves the tab. Calms her! I was surprised at how well these worked! My dogs tend to get agitated when we have visitors, especially strange men. I gave the dogs the appropriate number of pills about 30-45 minutes before expecting company. It didn’t make the dogs seem drugged, but they were definitely just more mellow. After a couple minutes of loud “greeting,” they settled down. It was magical! It seemed to continue to work for a few hours. I was very pleasantly pleased to find that this product worked. I give my dog one when I leave the house to do errands, etc and he takes a nap and doesn’t cause a fuss by barking while I’m gone. He also usually eats it right up or I wrap it in a little piece of cheese. I’ll be coming back for more of these. My dog is less stressed, so I am less,stressed! Wonderful product. 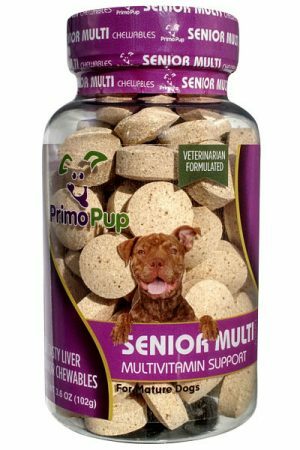 This product has worked wonders for our 3 year old shih tzu-poodle mix. She previously got extremely anxious while riding in the car- regardless if it was a 5 minute or 3 hour trip (shook/shivered and panted continuously). After we started giving her the the Primo Pup calming formula, she has a much better disposition in the car, and it seems she actually enjoys being in the car! No more shaking and panting, which makes for happier travel for all! 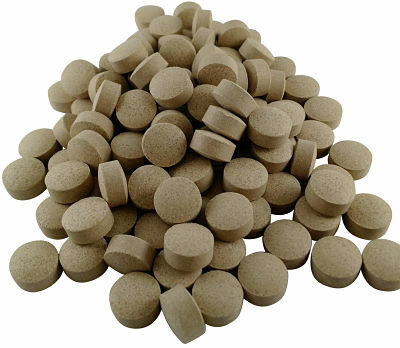 Chamomile 45 mg, Dried Hops 45 mg, Ginger Root Extract 35 mg, L-Taurine 20 mg, L-Tryptophan 10 mg. Brewers Dried Yeast, Cellulose, Liver Meal, Magnesium Stearate, Natural Flavor, Silicon Dioxide, Stearic Acid, Sucrose. CAUTIONS: Safe use in pregnant animals or animals intended for breeding has not been proven. Do not use in pregnant animals. If animals condition worsens or does not improve, stop product adminstration and consult your veterinarian. Do not use in dogs that have heart problems. Do not use this product prior to anesthesia or prior to surgery. Make sure your dog has plenty of water when using this product. Individual results may vary. Intermittent use only. Do not exceed 4 chewables per day. Do not use for more than 7 consecutive days.